The local elected members gratuity arrangements are implemented by means of a number of regulations and directions issued by the Minister for the Environment, Heritage and Local Government under the Local Government Act 2001. The purpose of this document is to explain the current retirement scheme and what it means in monetary terms to an elected member who is retiring. This document is for information purposes only, and is not intended to be a legal interpretation of the various regulations and circulars which have been adopted by the Department. It is a matter for each Councillor to inquire from the Finance Department of their local authority to obtain a calculation of his or her entitlements and to contact their local tax office in relation to any tax implications which may arise for them. On retirement a local elected representative with at least 2 years service will receive a lump sum payment of a gratuity for service from 4th May 2000, and an ex-gratia payment for years of service prior to that date up to a maximum allowable 40 years service. The significance of May 4th 2000 is this is the date the Local Government Bill was published. 2. An ex gratia payment for service prior the 4th May 2000. The minimum qualifying period for an elected member to be paid the gratuity is 2 years. This means that an elected member is eligible for a payment after two years service. A death in service payment is available under the Scheme. There is a minimum payment of the greater of one years representational payment (currently €16724 per annum) paid on the death of a serving member or the amount of gratuity/ex-gratia payment which would have been payable to the member on the date of death if the member had ceased to hold office on that date on the grounds of permanent infirmity, whichever is greater. This payment is made to the deceased member’s legal personal representative onproduction of a grant of probate/letters of administration. The amount of gratuity payable is for years of service from 4th May 2000 (the date the Local Government Bill was published). The gratuity payable is 1/5th of the representational (R.P.) payable at the time of retirement per year of service from May 4th 2000. At the current rates of R.P. the gratuity is €3344.80 per year of service from 4th May 2000. If the member has County Council and Town Council service at the same time the gratuity will be paid for the County Council service only. If the member had both County Council service and Town Council service after May 2000, but not at the same time, that member will receive a reduced gratuity for the Town Council service. The amount of the reduced gratuity depends on the size of the town council involved. The maximum gratuity payable after 20 years service from May 2000 is four times the representational payment. Payment of the gratuity is made once a retired member has reached 50 years of age or earlier if a member became incapable of performing his or her duties due to permanent infirmity of mind or body or dies in office. When a person ceases to be a Councillor before age 50 due to retirement or not being re-elected, the gratuity will be preserved until that person reaches 50 years of age, and will be paid based on the representational payment applicable at that time when they reach 50 years of age. Any entitlement to the preserved gratuity will cease if a person becomes an elected member again before reaching age 50. When this happens the earlier service will be aggregated with the subsequent service to determine the amount of gratuity to be paid once the person finally retires. In calculating the gratuity the total service by an elected member may include a fraction of a year. A member who was elected in June 2009 and who is not re-elected or retires in June 2014 will receive one full year’s representational payment €16724. Where a member with at least 3 years and less than 20 years qualifying service ceases to hold office, on account of having become incapable of performing his or her duties as a member due to permanent infirmity of mind or body, the local authority may add a period to his or her qualifying service for the purposes of calculating the amount of gratuity payable. The total of added years service together with the members qualifying service must not exceed 20 years. (ii) 3.33 years subject to the members total potential service to age 50 not being less. (c) For service of not less than 10 years, 3.33 years may be allowed subject to the member’s total potential service to age 50 not being less. (e.g. A member aged 48 would only receive 2 years additional service.) The sum of actual service and added years may not exceed 20 years in total for the purposes of calculating the gratuity payable to the member retiring due to permanent infirmity. 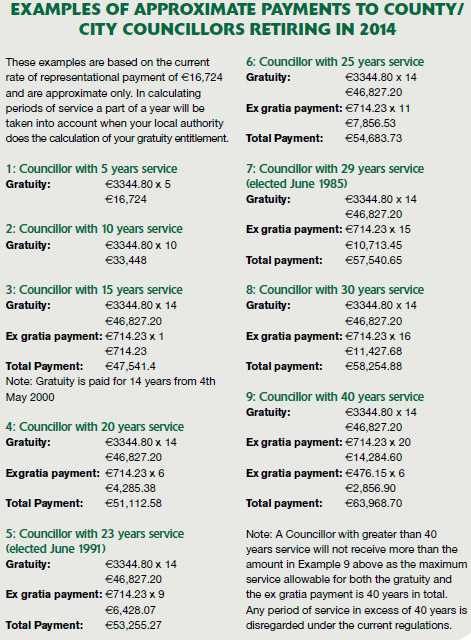 An Ex gratia payment of €714.23 per year of service is paid to serving councillors for their years of service prior to 4th May 2000. Retiring members of County Councils or Corporations of a County Borough were paid £750 for the first 20 years of service and£500 for any additional years of service up to a maximum total service of 40 years. The figures of €714.23 and €476.15 are 75% of these amounts. Retiring members of Corporations of a Borough (other than a County Borough) or an Urban District Council were paid £375 for the first 20 years of service and £250 for any additional years of service up to a maximum total service of 40 years. The figures of €357.11 and €238.08 are 75% of these amounts. Retiring members of Town Commissions were paid £187.50 for the first 20 years of service and £125 for any additional years of service up to a maximum total service of 40 years. The figures of €178.56 and €119.04 are 75% of these amounts. Under the 1999 Retirement Scheme, members who held dual or concurrent membership of more than one local authority were entitled to be paid for service for the local authority which gave the most favourable payment. In the case of both County Council and Urban District Councils service the payment will be for the county council service only. All local authority service by an elected member is taken into account for the purposes of determining the Ex gratia payment. If the member was, for example, a member of an Urban District Council before he/she became a member of a County Council , the service on the Urban District Council will be taken into account in determining the Ex gratia payment on retirement. Under current tax legislation a portion of the retirement payment may be liable to income tax. The Revenue Leaflet IT21 “Lump Sum Payments on Redundancy/ Retirement”, which is available on www.revenue.ie, provides further information on the tax treatment of lump sum payments. 3. Standard Capital Superannuation Benefit (SCSB) is a relief given for each year of service equal to 1/15th of the average annual pay for the last 3 years of service. Your Council is obliged to deduct PAYE and USC on all of the lump sum less the basic exemption or SCSB, as previously outlined above. The taxable part of the lump sum payment is regarded as part of your total income and is taxed accordingly. In certain circumstances an additional relief called Top Slicing Relief may be due to you. Top Slicing Relief relates to the tax payable and ensures that your lump sum is not taxed at a rate higher than your average rate of tax for the three years prior to your retirement. The formula for calculating this relief is: Taxable lump sum X (tax rate applied to lump sum – average tax rate for previous three years. In the case of a couple, taxed under joint assessment, where both spouses or civil partners have income in any of the three years preceding the tax year to which the termination payment refers, the tax rate will be based on the income of the spouse or civil partner who received the termination payment or on the combined income of both spouses or civil partners depending on which rate is the most beneficial to the couple. A County or City Councillor retires in June 2014. The taxable amount of the lump sum is €10,000, which is taxed at the marginal rate of 41%. The average rate of tax for the prior three tax years was 32%. Top slicing relief is: €10,000 x (41% – 32%) = €900. The tax payable will be reduced by €900. Top Slicing Relief may be claimed, by contacting Revenue after the end of the tax year. The time limit for claiming tax reliefs in respect of lump sum payments is four years from the end of the year in which the lump sum payment is treated as income.